Here’s today’s organic and natural shopping trip at Costco. I go to Costco about once a month and stock up on items we use regularly. This saves me a ton of money in the long run, and most items last me a month or more. In this case, some of these items will last us about two months. I decided to stock up even more so I can wait longer until I visit Costco again. Please excuse my messy home in the background! Total spent on everything in the photo: $241.32. Gasp! Well if this stuff ONLY lasts me for a month (which most of it will go longer), that’s an average of $60 a week spent on organic and natural groceries. This is more than I normally like to spend, but we stocked up on a lot of items, and filled our freezer with three different big packages of organic vegetables, two organic chickens and much more. And you will be happy to know that I was able to update the Organic Costco Price List. 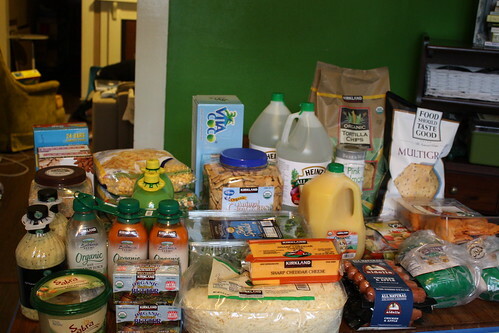 25 new items have been added to it, so check out the organic Costco deals here (bookmark it so you can find it easily as I try to update it once a month). If you shop at Costco, do you feel that it saves you money? Thank you for sharing. Organic chicken is not on your list. Is it from Costco? It’s under the organic section under meat on that list. wow your costco sells veggies like corn? Mine is a mix and its gross. If you think about it though all that stuff at a grocery stuff wuold have almost cost double! I shop at Costco and love it. I am a coupon shopper but buy what we use/need not a ton of processed food because it is cheap or free. Most of the year my Costco budget is $100 a month but I’ve found that during the summer the sales at my regular grocery store pretty much stink so I spend closer to $200 a month at Costco then. I am really excited because this week they opened a new and bigger Costco 5 min. from our hosue. I haven’t been yet though as the parking lot has been packed every time I’ve driven by and I haven’t been brave enough to fight the crowd with 2 toddlers just yet. I also have a question for you. I noticed that you bought the Kirkland brand cheese, is it organic? I buy the big bag of Kirkland shredded mozzarella for our homemade pizzas and I know it says no hormones so is that the same as what you get too? No the cheese is not organic unfortunately. It’s one of those items I’m just going to get and pray hard over before we eat it. We aren’t on an exclusive organic diet, but I try to do mostly organic and whole foods. Thanks for the reply. That is one of the things too I haven’t been able to switch to organic. The huge bag of shredded mozzarella lasts my family just a little over a month and that doesn’t include the sliced cheese we go through. I’ve tried the blocks of cheecks but my kids won’t eat it so the best I’ve been able to do is go with the Kirkland which says no hormones. I figure I change what I can and do the best that I can and it’s better than doing nothing. I shop at Costco’s and I love it. Unfortunately, it’s a 200 mile roundtrip, so I only go about every 6 weeks. I make one large purchase, stocking up on the basics. I try to make all our meals from scratch and buying in bulk really cuts down the cost per meal. Ours is far away as well Amanda, which is why I stocked up so much. With gas up to $4 a gallon here, I don’t want to make that trip anymore than I have to. Our Costco is 150 miles round trip so I only go about once every 3 months and I stock up on a lot of stuff. A trip can cost anywhere from $100 to $600. The jelly is hit or miss and mine too. I have been freezing pbjs in baggies for lunches so that helps when tehre out. If you do not mind my asking… how many are in your family and what are the age ranges? I asked as it seems like our grocery bill keeps climbing. After all our children moved out of diapers our grocery bill dropped but now that we are the midst of the teenage years it seems like it just goes up each month. I am shopping for a family of 5 with 3 boys between the ages of 12 and 17 and a large dog. Currently two are involved in sports but with summer coming on they will all be into swimming and bike riding again…. yep which means hungry boys! Our Costco is quite a drive, so we go only a few times a year, and use Sam’s Club more often, since it’s closer (but not nearly as good in quality as Costco!). We considered cancelling the Costco membership at one point, but what I save in allergy pills alone covers the membership cost. All four current members of my household need the Zyrtec (Costco’s Kirkland brand Allertec works the same) for these horrible ATL allergies! Costco has a bottle of 365 pills for just under $15–amazing.